Taking care of your pet’s teeth is more than just brushing and giving them crunchy treats to combat tartar. When it comes to canine dental care and feline dental care, veterinarians are teaching pet owners that dental care for pets is much more important than they realize. 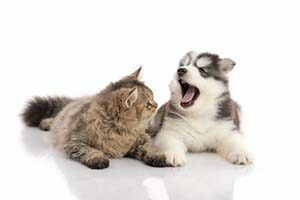 Today, dental disease has been recognized as one of the most significant issues that face cats and dogs in America. Advanced dentistry in Dartmouth is being used to help reduce the risk of developing dental disease. Studies show that approximately 70-80 percent of all cats and dogs will have some form of dental disease by the time they are just three years of age. Dental disease can cause bad breath, significant mouth pain, difficulty eating, lethargy and can even cause complications with heart and kidney disease. The first thing you need to start doing is to get your pet used to the idea of brushing. It does not have to be twice daily, but it should be at least twice each week. You can get them used to the brush by holding them on your lap or sitting next to them on the couch while watching television or relaxing. Play with the brush, let them smell it, look at it and taste it. Another way to get them used to the idea of brushing is to brush your fingertip over top of their teeth and gums so they understand that you aren’t hurting them. Cats and dogs are protective over their teeth, as they are over their nails and claws, because they are a defensive weapon in case they were attacked. You need to overcome the natural urge to bite or prevent you from sticking your fingers and the toothbrush in their mouths. Once your pet becomes familiar with the activity, you can use special toothpaste designed for use as dental care for pets. Human toothpaste should not ever be used. Routine dental cleanings are also an important part of maintaining health gums and teeth. This is true both for canine dental care and feline dental care. If your pet still resists dental care, you may need to bring them in to visit your local veterinary clinic for advanced dentistry in Dartmouth that includes the use of anesthesia for proper cleaning, evaluation, polishing and preventive treatments. Our staff at Anchor Animal Hospital is trained to closely monitor your pet while under anesthesia and all precautions are taken to reduce the risk of complications. As a result, even older pets can have routine dental cleanings at our clinic. Feline Dental Care – It is not unusual for cats to have significant and severe dental disease, especially if they do not have regular and routine dental cleanings. In some situations, the pet may not be able to eat due to the pain that comes from the disease spreading inside of their mouth. Our veterinarians at Anchor Animal Hospital have had extensive experience and training in the area of dental care for pets and oral surgery. Some have even received advanced dental training at the Animal Dental Training Center. Canine Dental Care – It used to be that veterinarians would just pull diseased teeth when patients came in with dental problems. However, thanks to advanced dentistry in Dartmouth, Anchor Animal Hospital can now perform advanced treatments that can often save pets’ teeth. The traditional method of pulling teeth often caused other issues, including broken off tooth roots, abscess pockets and continued problems, despite the teeth being pulled. Today, surgical approaches are used for complicated dental cases, which provide better results. Some of the surgical procedures that are available at Anchor Animal Hospital in Dartmouth can include oral surgery to repair defects that occur, as well as biopsies and tumor removal. Our clinic uses a variety of equipment, including digital dental X-rays, which can create images in less than 5 seconds. This is important in dental care for pets, as it can often be difficult to get good images using other types of X-ray and examination methods. Quality dental X-rays can be used to look at issues happening under the gums, such as retained or abscess tooth roots. Contact Anchor Animal Hospital to schedule an appointment for basic dental care for pets and advanced dentistry in Dartmouth by calling 508-996-3731. Our team can help you provide your pet with quality canine dental care and feline dental care that will improve their quality of life. Call today to schedule an appointment or to learn more about our veterinary services.